Beavers are best known for their dam-building. They maintain their pond-habitat by reacting quickly to the sound of running water, and damming it up with tree branches and mud. 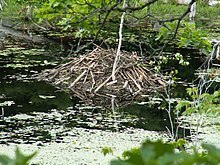 Early ecologists believed that this dam-building was an amazing feat of architectural planning, indicative of the beaver's high intellect. This theory was tested when a recording of running water was played in a field near a beaver pond. Although it was on dry land, the beaver covered the tape player with branches and mud. 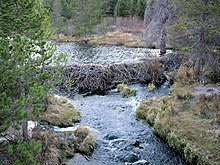 The largest beaver dam is 2,790 ft (850 m) in length—more than half a mile long—and was discovered via satellite imagery in 2007. It is located on the southern edge of Wood Buffalo National Park in northern Alberta and is twice the width of the Hoover Dam which spans 1,244 ft (379 m). Common natural predators include coyotes, wolves, and mountain lions. American black bears may also prey on beavers if the opportunity arises, often by smashing their paws into the beavers' lodges. Perhaps due to differing habitat preferences, brown bears were not known to hunt beavers in Denali National Park. Less significant predators include wolverines, which may attack a rare beaver of up to adult size, and Canadian lynx, bobcats, and foxes, predators of kits or very sick or injured animals rather than full-grown beavers due to their increasingly smaller size. American alligators, which only minimally co-exist in the wild with beavers, also seldomly threaten them. Both golden eagles (Aquila chrysaetos) and bald eagles (Haliaeetus leucocephalus) may on occasion prey on a beaver, most likely only small kits. Despite repeated claims, no evidence shows that river otters are typically predators of beavers but ancedotedly may take a rare beaver kit. 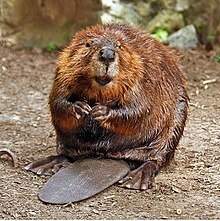 North American beavers have one litter per year, coming into estrus for only 12 to 24 hours, between late December and May but peaking in January. Unlike most other rodents, beaver pairs are monogamous, staying together for multiple breeding seasons. Gestation averages 128 days and they have a range of three to six kits per litter (usually 4-5). Most beaver do not reproduce until they are three years of age, but about 20% of two-year-old females reproduce. 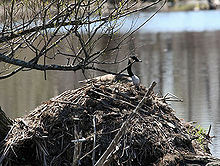 The beaver is a keystone species, increasing biodiversity in its territory through creation of ponds and wetlands. As wetlands are formed and riparian habitats enlarged, aquatic plants colonize newly available watery habitat. Insect, invertebrate, fish, mammal, and bird diversities are also expanded. Effects of beaver recolonization on native and non-native species in streams where they have been historically absent, particularly dryland streams, is not well-researched. Beaver have been discovered living in brackish water in estuarine tidal marshes where Chinook salmon (Oncorhynchus tshawytscha) densities were five times higher in beaver ponds than in neighboring areas. 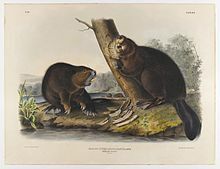 In the 1940s, beavers were brought to Tierra del Fuego in southern Chile and Argentina for commercial fur production and introduced near Fagnano Lake. Although the fur enterprise failed, 25 mating pairs of beavers were released into the wild. Having no natural predators in their new environment, they quickly spread throughout the main island, and to other islands in the archipelago, reaching a number of 100,000 individuals within just 50 years. Although they have been considered an invasive species, it has been more recently shown that the beaver have some beneficial ecological effects on native fish and should not be considered wholly detrimental. Although the dominant Lenga beech (Nothofagus pumilio) forest can regenerate from stumps, most of the newly created beaver wetlands are being colonized by the rarer native Antarctic beech (Nothofagus antarctica). It is not known whether the shrubbier Antarctic beech will be succeeded by the originally dominant and larger Lengo beech, however, and the beaver wetlands are readily colonized by non-native plant species. 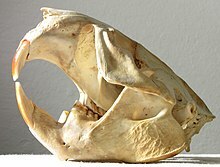 In contrast, areas with introduced beaver were associated with increased populations of the native catadromous puye fish (Galaxias maculatus). 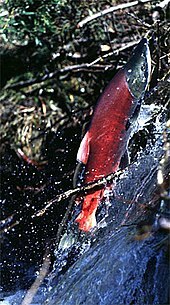 Furthermore, the beavers did not seem to have a highly beneficial impact on the exotic brook trout (Salvelinus fontinalis) and rainbow trout (Oncorhynchus mykiss) which have negative impacts on native stream fishes in the Cape Horn Biosphere Reserve, Chile. They have also been found to cross saltwater to islands northward; and reached the Chilean mainland in the 1990s. On balance, because of their landscape-wide modifications to the Fuegian environment and because biologists want to preserve the unique biota of the region, most favour their removal. ^ a b Rhoads, Samuel N. (1898). "Contributions to a Revision of the North American Beavers, Otters and Fishers". Transactions of the American Philosophical Society. New Ser. 19 (3): 417–439. doi:10.2307/1005498. JSTOR 1005498. ^ Browse Genus equals Castor by Scientific Name for All Museums Archived June 14, 2007, at the Wayback Machine. Berkeley Natural History Museums. Retrieved August 4, 2007. ^ Kieffer, Michael Meadows in Mist Archived September 29, 2007, at the Wayback Machine Bull Run Mountains Conservancy, Inc. Retrieved August 4, 2007. ^ a b Kitchener, Andrew (2001). Beavers. p. 144. ISBN 978-1-873580-55-4. ^ Outwater, Alice (1997). Water:A Natural History. New York, NY: Basic Books. p. 89. ISBN 978-0-465-03780-3. ^ Erlandsen, S. L. & Bemrick, W. J. (1988). "Waterborne giardiasis: sources of Giardia cysts and evidence pertaining to their implication in human infection". In Wallis, P. M. & Hammond, B. R. Advances in Giardia research. Calgary, Alberta, Canada: University of Calgary Press. pp. 227–236. ISBN 978-0919813861. ^ Thompson, R. C. A. (November 2000). "Giardiasis as a re-emerging infectious disease and its zoonotic potential". International Journal for Parasitology. 30 (12–13): 1259–1267. doi:10.1016/S0020-7519(00)00127-2. PMID 11113253. ^ McKelvey RW; Denningtonz MC; Mossop (1983). "The Status and Distribution of Trumpeter Swans (Cygnus buccinator) in the Yukon" (PDF). Arctic. 36 (1): 76–81. CiteSeerX 10.1.1.581.427. doi:10.14430/arctic2245. JSTOR 40509470. Retrieved Mar 1, 2010. ^ Longcore, Travis; Rich, Catherine & Muller-Schwarze, Dietland (February 2007). "Management by Assertion: Beavers and Songbirds at Lake Skinner (Riverside County, California)". Environmental Management. 39 (4): 460–471. CiteSeerX 10.1.1.580.5210. doi:10.1007/s00267-005-0204-4. PMID 17318698. ^ Rutherford, W.H. (1955). "Wildlife and environmental relationships of beavers in Colorado forests". Journal of Forestry. 53: 803–806. Archived from the original on June 5, 2011. Retrieved February 28, 2010. ^ Collier, Eric (1959). Three Against the Wilderness. Victoria, British Columbia: Touchwood. p. 288. ISBN 978-1-894898-54-6. ^ Holingue, Scott (1994). Tales from an Urban Wilderness: Wildlife's Struggle for Survival in a Park Where City & Wilderness Meet. Chicago, IL: Chicago Historical Bookworks. p. 140. ISBN 978-0-924772-25-2. ^ a b Anderson, Christopher B.; Pastur, Guillermo Martinez; Lencinas, Maria Vanessa; Wallem, Petra K.; Moorman, Michelle C. & Rosemond, Amy D. (2009). "Do introduced North American beavers Castor canadensis engineer differently in southern South America? An overview with implications for restoration" (PDF). Mammalian Review. 39: 33–52. doi:10.1111/j.1365-2907.2008.00136.x. Retrieved March 17, 2012. "Castor canadensis". Integrated Taxonomic Information System. Retrieved March 18, 2006. Müller-Schwarze, Dietland & Sun, Lixing (2003). The beaver: natural history of a wetlands engineer. Cornell University Press. p. 190. ISBN 978-0-8014-4098-4. Mills, Enos (1913). In Beaver World. Kessinger Publishing. p. 255. ISBN 978-0-7661-9387-1. Collier, Eric (2007). Three Against the Wilderness. Touchwood Editions. p. 288. ISBN 978-1-894898-54-6. Long, Kim (2000). Beavers: A Wildlife Handbook. Boulder: Johnson Books. p. 37. ISBN 978-1-55566-251-6. 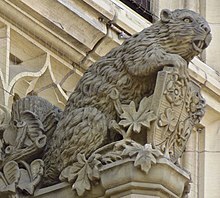 Wikimedia Commons has media related to Castor canadensis.